A teenager who brandished a crossbow at police after crashing his mother's car has been sentenced to unpaid work. Sam Newns drove off in his mother's car with "an arsenal of weaponry" after discovering "flirtatious" messages from a man on her computer in Falkirk in September 2014. The 18-year-old crashed the car, injuring three people, and later confronted police with a crossbow. He admitted a number of charges and was sentenced to 200 hours of unpaid work. Newns will also be under supervision for two-and-a-half years, and was banned from driving for 18 months. The teenager was enraged when he found messages from a man on his mother's tablet, despite his parents having been separated for approximately 10 years. At about 20:00 on 18 September he drove off in her VW Golf, despite only having a provisional licence. Driving without lights and speeding, he crashed into an oncoming Mazda, leaving the driver and two passengers with "severe whiplash". 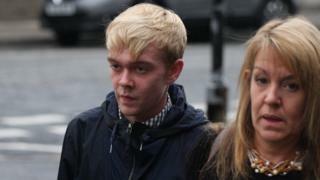 Newns failed to stop after the collision, and around this time his mother Frances called police and warned him he had "left the house in a bad mindset". Police found the badly damaged car at Limerigg Primary school, on the B825 road between Slamannan and Caldercruix, close to the Black Loch. Officers had been joined by Newns' father John outside the school at about 21:20 when the teenager appeared with a crossbow in his hand, and a bag over his shoulder containing what prosecutors called "an arsenal of weaponry". This included a lock-knife, a machete, a small axe, crossbow bolts, a retractable saw, ball bearings and a slingshot. Newns brandished the crossbow at officers before placing it against his own head and walking off in the direction of Limerigg. Police followed him as he ran off into the woods, before eventually coming out and surrendering to an armed response unit. Newns, of Maddiston, Falkirk, admitted dangerous driving, drink-driving, failing to display learner plates, possessing a crossbow as an offensive weapon and brandishing it in the direction of officers. He also pleaded guilty to possessing knives, a machete, an axe and other weaponry in a public place without reasonable excuse. Defending, Stephen Biggam said Newns had "taken a decision to get away from everybody and live life in the wilderness, and hunt animals and rabbits, away from all the family difficulties". Sentencing him to community service, Sheriff Wyllie Robertson told Newns: "Am I going to sentence you to detention, that's what you want to know? The answer is I don't know. The clear answer is not yet. "I am going to impose a community payback order which will be strict and enduring. A very significant sentence of detention awaits you if you don't comply."